Books and articles by and about the actors who starred in the “Little House on the Prairie” TV series provide a behind-the-scenes look at the show and how it affected the lives of the people making it. 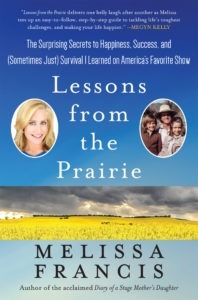 Here is a brief overview of Lessons from the Prairie: The Surprising Secrets to Happiness, Success, and (Sometimes Just) Survival I Learned on America’s Favorite Show by Melissa Francis. Broadcast journalist Melissa Francis is also the author of the acclaimed memoir, Diary of a Stage Mother’s Daughter. She is an anchor on Fox News Channel and Fox Business Network, and a regular contributor on financial, economic, and political issues. As an actress, she appeared in numerous motion pictures, television series, and more than a hundred television commercials, and is best known for her role as Michael Landon’s daughter, Cassandra Cooper Ingalls, on “Little House on the Prairie“. She lives in Manhattan with her husband and their three children. Pick up your own copy of Lessons from the Prairie: The Surprising Secrets to Happiness, Success, and (Sometimes Just) Survival I Learned on America’s Favorite Show here. Check out our Recommended Reading for Adults and Recommended Reading for Children & Young Adults for more great books.